Read below why we ten women set a new goal for May 1, 2019, and for WHY CONTRIBUTE—even if you don't personally bike! For more comments about Bicycling Monterey projects—including www.bikemonterey.org—click here (or for a few, scroll down). FAQS: Every contribution to Bicycling Monterey is listed on the site's financial contributors page. (Contributions made via Go Fund Me are listed here as well.) When a contributor prefers it, they are listed as Anonymous. Contribute right here, via GFM. Or for other ways to contribute—by check or PayPal—and for giving FAQs, click here . ABOUT BICYCLING MONTEREY: Bicycling Monterey provides inspiration and resources for people who bike anywhere and also serves as an Information Hub for Bicycling Monterey County. Bicycling Monterey is a local partner of the California Bicycle Coalition and is recognized nationwide and beyond as a reliable resource, including by organizations ranging from League of American Bicyclists and People for Bikes to the Monterey Bay Aquarium. OUR GOAL: For May 1, 2019, we ten women set a new fundraising goal. While we appreciate Mari's generous spirit, it isn't reasonable to expect one unpaid volunteer, Mari, to continue making tremendous personal sacrifices to provide such a highly praised and award-winning public service. Contributors of project supplies and volunteers over the years have certainly been appreciated. Nevertheless, the daily average of total financial contributions from May 1, 2009 to March 1, 2019 was just $3 a day! 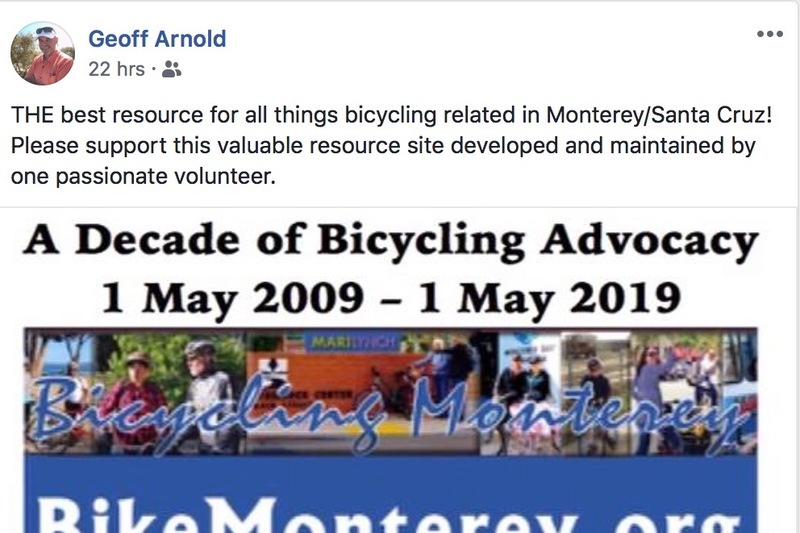 Our goal is to raise that to $10 a day, in recognition of all that Mari accomplished over Bicycling Monterey's first 3,650 days, and to provide support for this work to continue into a second decade. Many people don't realize that for ten years, Bicycling Monterey has had no paid staff! Contributions in any amount are appreciated, and SHARING this page is also helpful. WHY CONTRIBUTE: More people bicycling brings multiple benefits—even for people who do not bike—from reducing carbon emissions and traffic congestion to improving public health to strengthening communities. 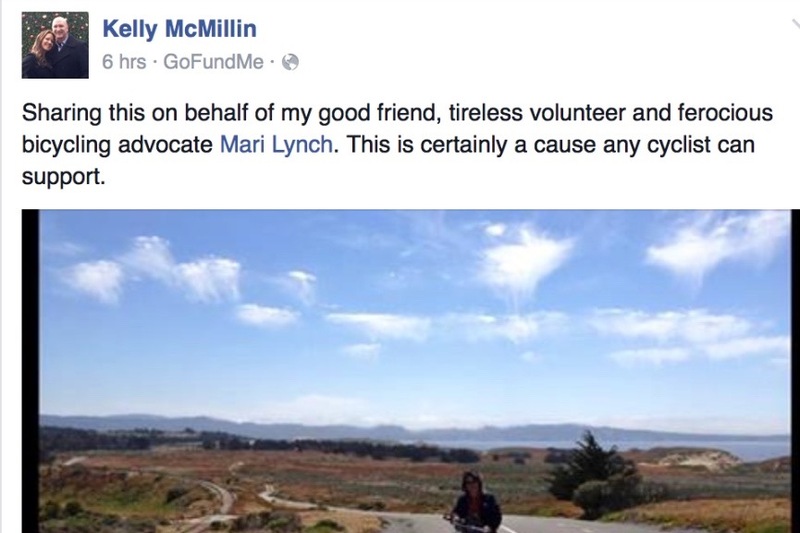 Mari Lynch Dehmler has done all her Bicycling Monterey work as an unpaid volunteer. In addition to donating well over 12,000 hours of her personal time, she has also paid all expenses of the website and other Bicycling Monterey projects not possible to pay from the modest amount of total financial contributions received since 2009. That includes Mari paying expenses for public outreach; the HER Helmet Thursdays Project; bike equity efforts; bike education for incarcerated youth; education and advocacy on infrastructureand other local, state, and national bicycling issues; Open Streets support; and other projects . WHAT PEOPLE SAY: The Bicycling Monterey website and projects are widely acclaimed by visitors and residents of Monterey County, as well as people far beyond. ABOUT MARI: Mari was born near Chestnut, Illinois, where her parents then farmed. She is an alumna of Southern Illinois University, where she was a President's Scholar. Mari has been a resident of California's Monterey Bay Region since 1976, and resides since 1981 in rural unincorporated Monterey County. Mari has a son and daughter, both born and raised in the Monterey Bay Region. 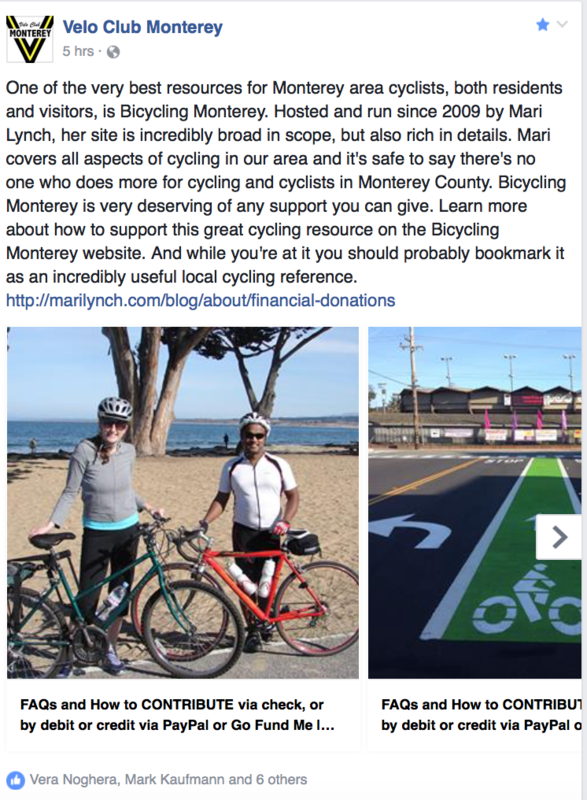 We are pleased to know Mari well and to encourage your support for the Bicycling Monterey website and projects. We first launched this Volunteering and Service crowdfunding campaign in Dec 2015. Please help us reach the new fundraising goal by May 1, 2019. QUESTIONS? Phone Bicycling Monterey anytime! See Mari in a KSBW video introducing HER Helmet Thursdays, which grew to include hundreds of Monterey County businesses and organizations giving discounts to people who bike. That's just one of many Bicycling Monterey projects! Click the following link to watch the KSBW video on Youtube: https://youtu.be/0VSPKEW9eJA?t=15 . Image below: Poster for May 31, 2019 Bike Night, a meet-up hosted by Mari for local incarcerated boys. Mari also founded the bike class series at the same location (the Monterey County Probation Department Youth Center); that series completes its 7th year in April 2019. Click here to learn more. Bicycling Monterey PROJECTS 2009-2019 include the following and more. For project details and photos, click here . 1. Education and Advocacy Regarding Infrastructure and Other Local, State, and National Issues Affecting People Who Bike. 2. Public Outreach to Increase Awareness of the Multiple Benefits of Bicycling. 3. Discounts to Encourage Bicycling: The HER Helmet Thursdays Project. 4. Bicycling Equity Efforts—Including Outreach to Spanish Speakers, to People Not Online, and to Low-Income Individuals. 5. Foster Positive Relationships with Law Enforcement Professionals: Pro-Active Relationship Building between Law Enforcement Agencies and People Who Bike. 6. Founded Bicycle Education Program for Incarcerated Youth, including Monterey County’s First High School Bike Tech Class. 7. 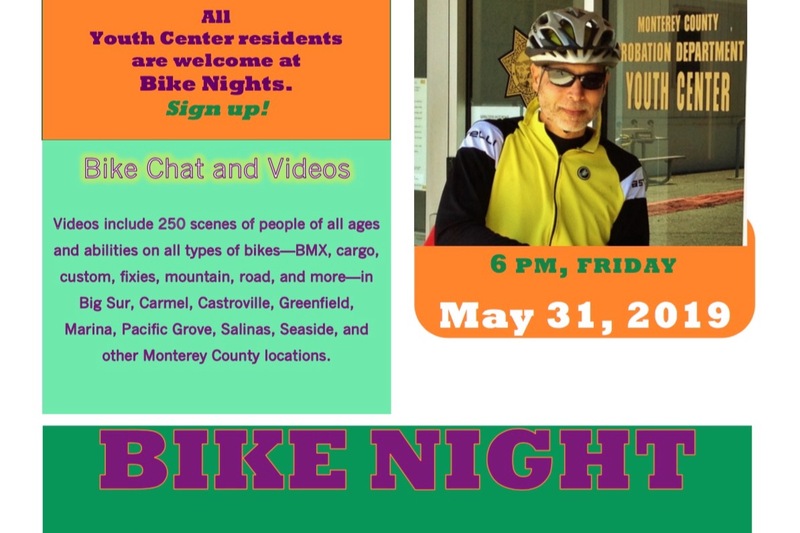 Provide General Bicycling Education for Incarcerated Youth / Bike Nights at the Monterey County Probation Department Youth Center. 8. Serve as Information Resource and Support for People Anywhere, as well as for Monterey County’s Tourists/Visitors and Local Residents—By Phone and in Person, as well as Online. 10. Website: Create and Provide over 660 Posts and Pages of Original, Carefully Researched Content, including Thousands of Original Photos. 11. 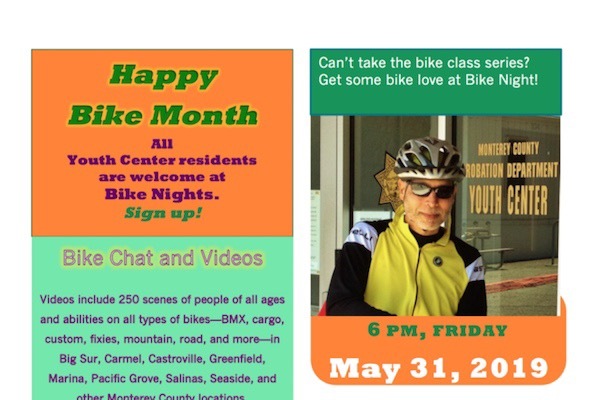 Promotion of Monterey County Biking or Bike-Related Activities, Events, Meetings, and More. 12. Support for Open Streets Events. For lots more comments about the value of the Bicycling Monterey site and projects, click here . 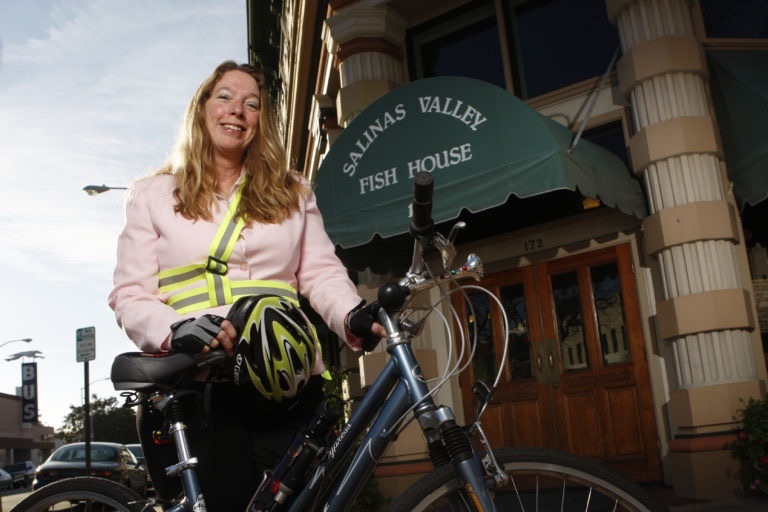 Photo below of Bicycling Monterey's founder is by Scott MacDonald © 2010 by the Salinas Californian. Used by permission. You may contribute to the Bicycling Monterey work via PayPal, check, cash, or via Go Fund Me. For FAQs and ways to contribute, click here. See the complete list of financial contributions to date. Financial contributions in any amount are appreciated. Those made via Go Fund Me are automatically listed in the right-hand sidebar of this page. If you prefer to contribute via PayPal or by check (click here for payment options and FAQs) but would still like your contribution listed on this GFM page's sidebar, we'll be happy to add it there at your request. (GFM refers to such contributions as an "offline donation.") If you'd like that, simply include a note if mailing a check, or if contributing via PayPal, include a message: "Please list my contribution on Go Fund Me too." Special shout-out to Edith Frederick, an automatic monthly contributor. Gratitude to the first five contributors toward our May 1, 2019 goal, and a special shout-out to a Salinas resident who is a Pedal Pusher ( https://bit.ly/PedalPush). 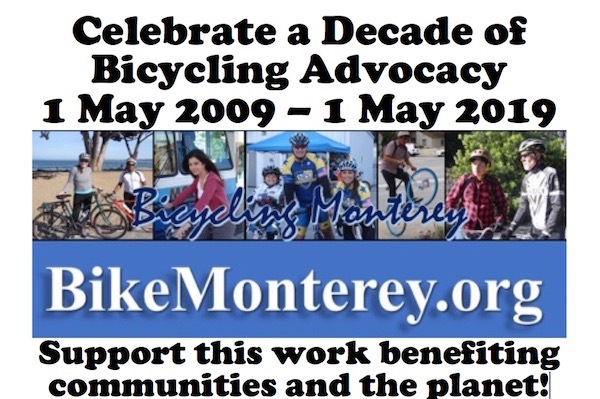 May 1, 2019 marks the 10th anniversary of the Bicycling Monterey site and projects. More people bicycling benefits individuals, communities, and the planet. Bicycling Monterey has been an unpaid public service for ten years. Please consider making a contribution, in any amount, and help spread the word by sharing a link with others. Thank you. 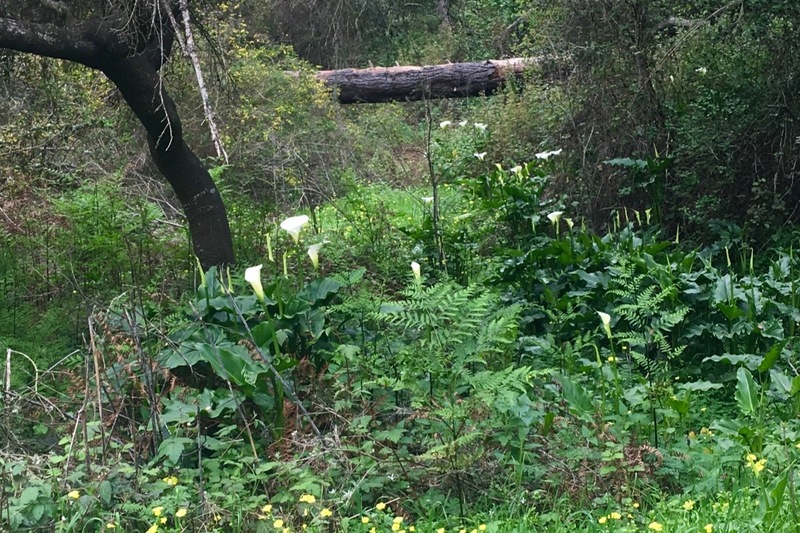 Today's photo: What you see out biking includes spring flowers like these calla lilies in the Don Dahvee Greenbelt, city of Monterey. The location is near the Del Monte Shopping Center. For related tips, see https://bit.ly/ShopByBike , one of the 20 sections of Bicycling Monterey's Tips for Bicycling Monterey County guide, https://bit.ly/BikeMRY (which also includes tips for bicycling anywhere). This image is a poster from one of Bicycling Monterey's upcoming activities—a meet-up hosted by Mari. To learn more about that, click the Story tab, then scroll down our message to that image. Our gratitude to the first contributor toward our May 1, 2019 goal. That contributor is an individual who Mari has never met or spoken with. They have never emailed or otherwise contacted her with questions or input. 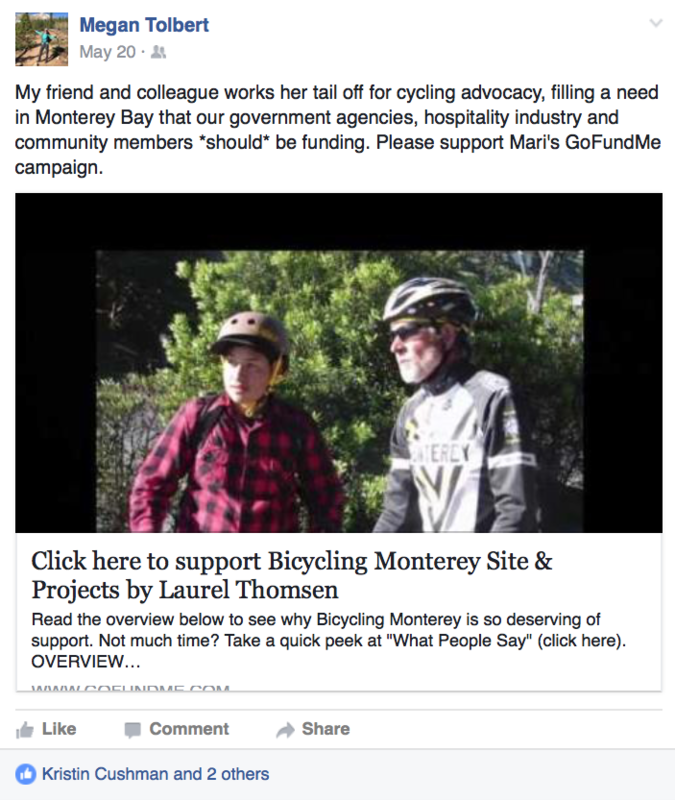 Yet they've been a financial contributor to the Bicycling Monterey work since 2010. Apparently they simply recognized early on how much time and resources are required to provide www.bikemonterey.org and other Bicycling Monterey projects, and wanted to help. And they have! Please follow their lead by pitching in now. Whether $5, $500, or any amount, your contribution will be appreciated. SHARING a link to this page is also helpful. Thank you! In recognition of ten years of the Bicycling Monterey work, we've set a new fundraising goal. Please read our new Story on this page. And please SHARE this page with others, to help us meet our new fundraising goal by May 1, 2019. Thank you! I totally appreciate the work that Mari and her staff at BikeMonterey are doing with bicycle advocacy. They need all the help that they can get. Thank you! Mari has worked so hard for so long on work that is so important to our community. I support Mari's good work and community education. Bicycling is one important way to contribute to a more healthy environment.